To provide the daily weather forecast in TV, web and newspapers, not only satellite imagery is analyzed, but also data from measuring stations on the ground provide important data points. But how does the measurement and visualization of temperature and humidity values work exactly? In this lesson we measure and display air-temperature and -humidity using the HDC1008 sensor. The HDC1008 from Texas Instruments series HDX100X combines two sensors on one breakout board: It can measure relative air-humidity from 0% - 100% and temperature from -40°C to 125°C with an accuracy of ±4% and ±0.2°C respectively. Communication between Arduino and HDC1008 is handled on the serial bus I²C. Unlike simple analog or digital signals, with I²C multiple devices (like sensors or displays) may communicate on the same cables through a parallel circuitry. Each device has therefore a unique identifier that is used to separately address it in communications. Connect the devices as shown in the graphic below. Before starting to write code, we need to install the HDC100X.h library. If you have not done this in one of the previous chapters, you should follow the chapter Software Installation. Hint: Unlike expressions, a directive (beginning with #) does not end with a semicolon. The rest of the program may now use the included functions from these libraries. In order to connect to the sensor, the HDC100X library needs to know the I²C address of the sensor. The HDC1008 listens to the address 0x43 (see datasheet). With this command we created an instance hdc of the sensor, on which we can call functions to talk to the sensor. Hint: These functions return the measured value as float. Be sure that the variables you want to store the measurements in has the correct data type! 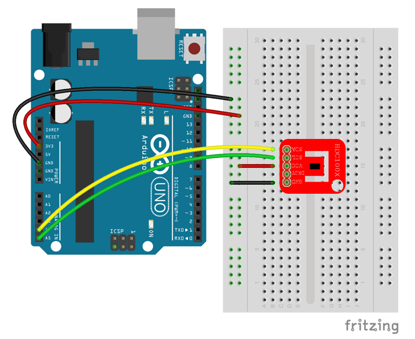 Build the circuit thats depicted above and try to read measurements from the HDC1008 sensor. Print the measured values to the serial monitor. Hint: If you&apos;re stuck, have a look at the example thats included in the folder of the HDC100X.h library.